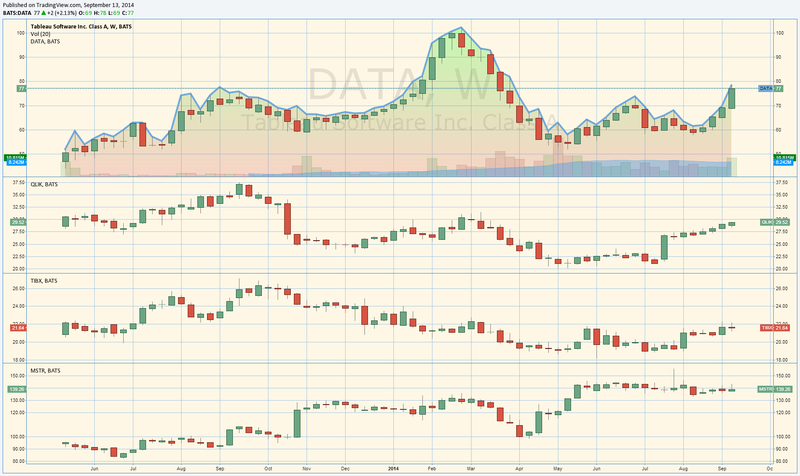 For me the more indicative then the stock prices, market capitalization and a number of participants in customer conferences are numbers of job openings for competing vendors and Tableau has 270+ of them (more than 20% of its current number of employees), QLIK has 120+ (about 7% of its number of employees) and TIBCO has only about 2 dozens of openings related to Spotfire (unless I misread some other openings). For the quarter finished June 30, 2014, the company posted a year-over-year revenue increase of 82% with just over $90 million in revenue. Headcount was up 62% year-over-year to 1,532 employees worldwide. Keynotes and sessions of TCC14 were packed (you cannot find available seats on images below) and full of interesting info and even entertainment for new users and customers. 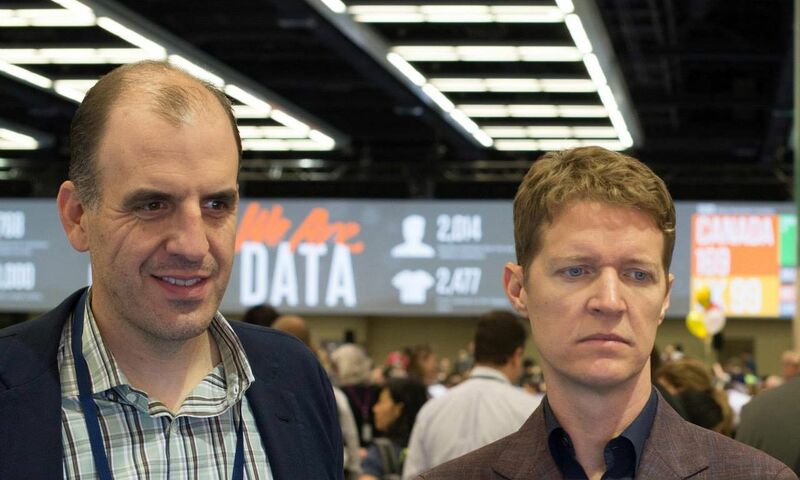 These 2 fresh multimillionaires (see below, not sure why Christian’s face looks unhappy – I guess it is just me) opened TCC14 as usual, with exciting keynote. You can find their keynote either on TCC14 website (link below) or on Youtube (below TCC14 link). 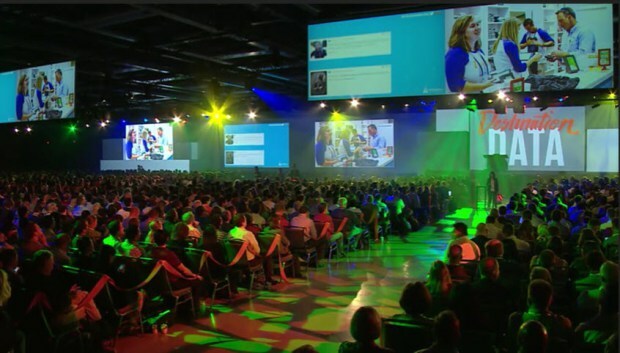 Keynote contains 3+ parts: two speeches from co-founders (this year Christian choose theme of “Data Art” – I am not sure if it help sales, but nevertheless entertaining and very speculative topic) and the rest of keynote about new features in upcoming release of Tableau (8.3 and 9.0?). 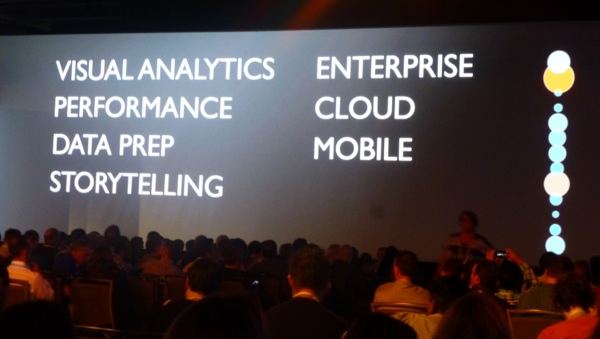 As you see from slide below, Tableau is positioning new features in 7 groups, and I will try to mention those. Among other features, Chris introduced “Lasso & Radial Selections”: these selections allow interactors to select points in shapes other than just a square. In Stolte’s keynote, he used a map as an example. He only wanted to lasso points in a city from the northwest to the southeast, not selecting some along the way. The shape ended up being like a figure eight. This was impressive. Vice-President of Product Marketing Ellie Fields talked about new developments forthcoming in Cloud computing with Tableau, featuring Tableau Online as a platform for connecting Cloud data warehouses and applications in conjunction with on-premise data which can be presented in web browsers, on mobile devices, or even encapsulated in embedded applications. 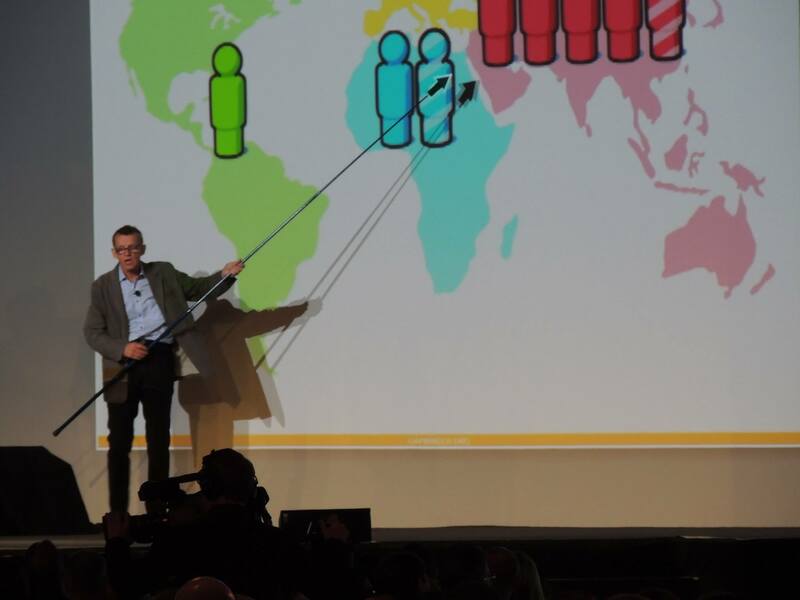 Of course the star of TCC14 was Prof. Hans Rosling – as keynoter as well as part of the excited crowd. Hans stars even in cafeteria (could not resist to include his picture seating at table with right hand raised). 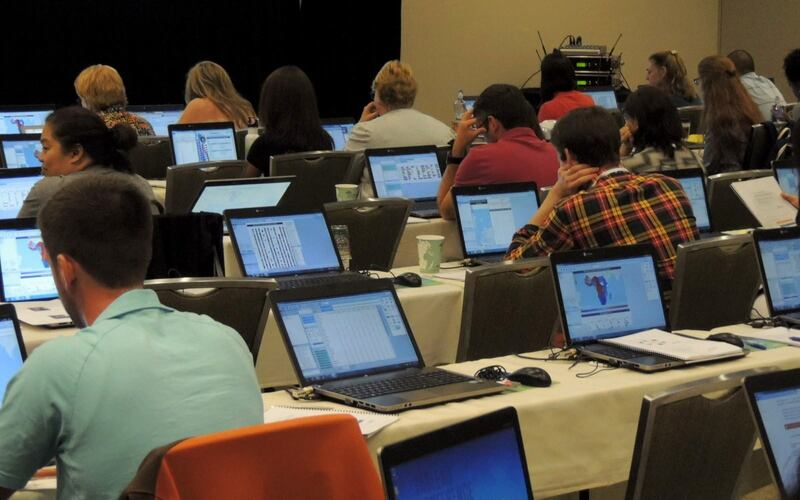 Tableau provided during TCC14 a lot of classes and training sessions – almost all of them were well prepared and packed. Expect many of them to be available online – many for free. and also Tableau’s approach to Product management with these priorities (I am curious if they always followed in real life): Quality – Schedule – Features. Andrei, Thanks for including Qlik in your post. There are a number of points that I did want to address. First, in regards to your comments “slow growth of QLIK sales”. 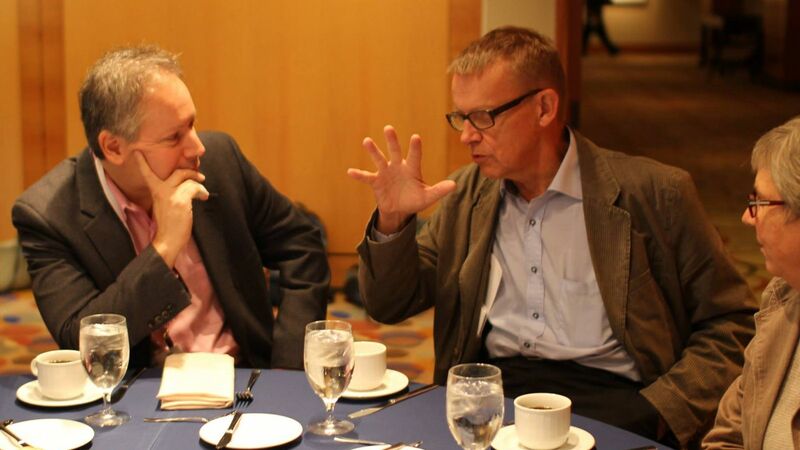 In FY2013 Qlik’s annual revenue grew 21% to $470.5 million. Is 21% on a higher revenue base slow? We don’t believe it is. “QlikView.Next” was simply a project name. The output of that project is in fact Qlik Sense which is now generally available. See the press release at http://www.qlik.com/us/company/press-room/press-releases/2014/en/0917-qlik-launches-full-qlik-sense-product. QlikView 12 (i.e., a new release of QlikView) is planned for release next year. Again, thanks for including Qlik and for your continued interest in our company and products. Dear John: glad to hear from my old friend! 1. YES, 21% YoY is a very good rate of growth for everybody except for QLIK and Tableau, but when I said “slow” I referred to a much better YoY rate Tableau is still demonstrating now and QLIK had in the recent past. 2. So far not too many people said that QLIK.NEXT will never will be delivered under that name and QLIK Sense is the replacement name for it. QLIK’s website still has pages about QlikView.Next referring to it as a Product, see it here: http://www.qlik.com/next/our-vision.html . Multiple people from Qliktech told me before that the main client for Qlik.Next will be HTML5 client and I expected that as oppose to Qlik Sense Desktop you originally delivered – it was another reason I thought Qlik.Next still a valid name. 3. You are the first person telling me that Qlikview 12 will be delivered as a product. Again, multiple people from Qlik told us that Qlikview 11.2 is the end of the line and will be supported for 3 years but will be replaced by Qlik.Next (and nobody mentioned before that Qlikview 12 will be released or Qlik.Next is not the name of the product but merely name of the PROJECT) or as now it appears by Qlik Sense. It seems that QLIK did not communicate properly (if even me confused) of what is going on and about changes in its naming conventions and plans… I used info shared publicly by QLIK.